The last rotation I did went really well. This whole expedition the plan was to summit later than everyone, because not using oxygen I will be slower so there is a higher risk that I both create or get in big trouble from from a traffic jam on summit day. However, as I mentioned before this created a feeling in me that I was rushing to catch up. I felt insecure about my plan as others were climbing higher and higher while I seemed to be sick. Well, this rotation was a little different. 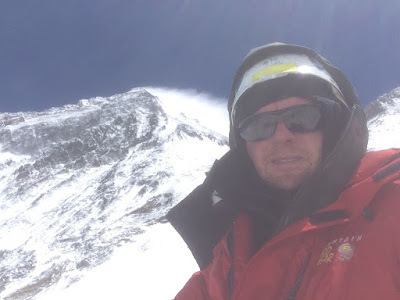 May 3rd we headed up from basecamp to camp 2, which was a very very long day. Only three of us made it to camp 2, a couple others stopped at camp 1 and one turned around with a lung infection. I think tent to tent it was like 11.5 hours, or maybe 10.5 hours. It was 5:15 from the crampon point to camp 1, and just over 4 hours camp 1 to camp 2. 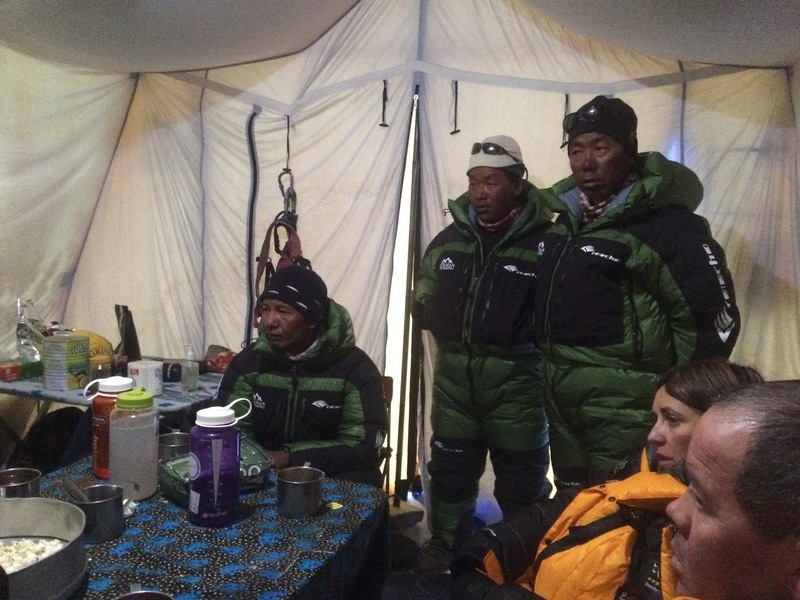 We spent about 50 minutes getting to the crampon point and about 40 minutes in camp 1 resting. I was climbing with Alyssia Azar, Carsten Illibad, Sandoop and Pasang. I was planning to go up to camp 3 the next day, but I was tired so I took a rest day, which included a little hike on the rock pile behind camp 2. I did take 500 mg of some powerfull ibuprofen type something that David Llano gave to me the first night we were in camp 2. The second night I took a standard 200 mg ibuprofen and I slept well. 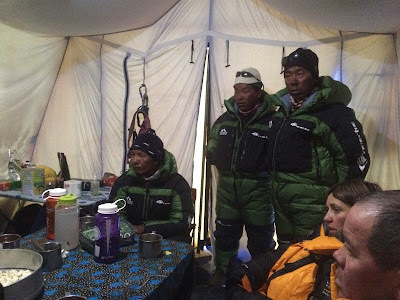 It was funny as we are sitting around the dining tent at camp 2 on May 4th debating what to wear for the climb to camp 3, three of our Sherpas walk in wearing their down suits to discuss the plan for tomorrow. It was pretty funny, and everyone with a down suit then planned to wear it. I didn’t have one so I just wore my down jacket and synthetic insulated pants. So Cinco de Mayo comes and we wake up at 5 for a 6 AM departure. We started off across the valley to the start of the Lohtse face. I was with Hazel, potentially first Welsch woman to summit Lohtse, Tenzing, her Sherpa who was short roping her, and Shera Sherpa, who was sort of climbing with me for the day. At the start of the face she had a problem with her mittens so I passed her and Tenzing and went on my own up the face. It was great! I was climbing so well, I was passing everyone else. When I made it to the steep part where there is an ice blue there were some other people coming down, who I assume had spent the night in camp 3. One man, basically clipped into the rope, held on, and then slid down the 60-65 degree ice and snow gully destroying all of the snow steps. He looked in a bad way, and it was really frustrating because I felt fine. His Sherpa and his friend were above him about to start the rappel and I raised my arms in wonder and told them both that I thought their friend needed some help. I mean, it was a bright sunny day with very little wind, it wasn’t a particularly difficult section, and we were at a particularly high altitude. There are two ropes at this section so I was on the ascending rope and he was on the descending rope, but they are only maybe four feet apart and the ice bulge has a little gully maybe two feet deep that kind of forces the two ropes together. Anyway, after that I was basically on my own for the remaining few fixed rope sections to camp 3. At the bottom of camp 3 I looked around and could not find our tents, so I sat near the top of the lower grouping of tents and waited for Shera to come up. Yes, just to toot my own horn for a minute, I waited at camp 3, at 23,300 feet, for the Sherpa I was climbing with to catch up. He did and our camp was set about 200 vertical feet higher just to the left of the route, actually out of sight of the route. There was no fixed rope for about 30 meters and no one really caries an ice axe on Mt. Everest, mine was left at camp 2, so Shera short roped me across the gap between the fixed rope and our camp. Not difficult, but you certainly don’t want to fall there. It took a little over four hours for me to go from camp 2 to camp 3 without a backpack. Two hours to the start of the face, then a little over two hours up the face to camp 3. We stayed up there maybe 20 minutes or so to eat and drink a little, then it took about an hour to get back to camp 2, it’s much faster to descend at altitude than ascend. Just as we were leaving Hazel and Tenzing showed up. I made it back to camp 2 in time to have lunch with everyone who did not make it up to camp 3. Everyone had a different issue from stomach bug to tiredness from two previous days. I slept well that night, I was actually somewhat warm in my soft-shell layer and insulated pants inside my 0F sleeping bag. The next morning we woke at 4 AM and were hiking soon after 5 AM. We were all pretty close until the start of the icefall. I had been trailing, not so fast on the way to camp 1, but after the first rappel and I was moving better and was again at the front. I made my way down and soon enough when I stopped to let a Nepalese team come up Shera was right behind me and after they passed we began running down the ice fall. I’m not joking, on the nice like 15-25 degree slopes downhill we were running. We didn’t run the flats, ladders, or uphills, but we were flying. We mad it to the crampon point at 8:11 AM, just under 3 hours from the time we left camp 2. From there it was a 40 minute walk back to our basecamp and I made it in time to have some breakfast and get the 10 minutes of questions from the other 2/3rds of the team about how our rotation went. Overall, quite well. It seems barring a tragedy our team will have lots of summits this year.